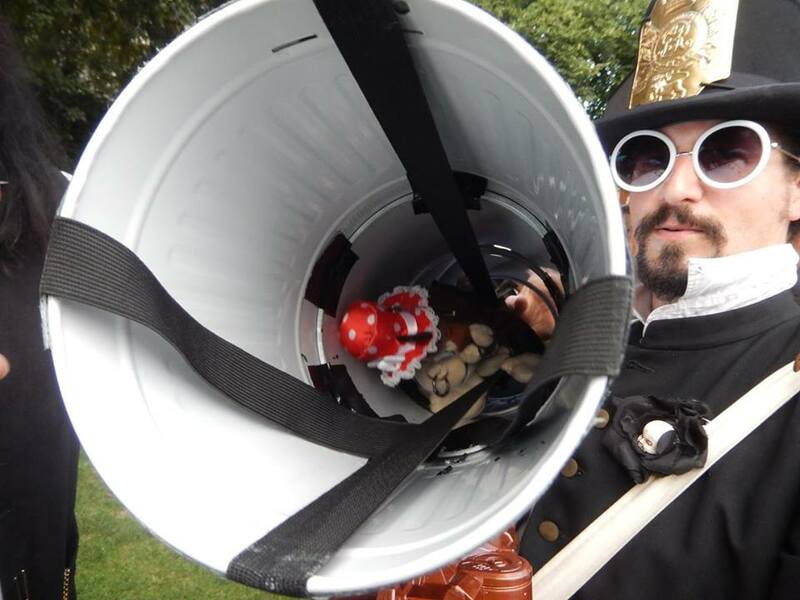 Having been very pleased that the Surrey Steampunk Convivial now held twice a year, had made the wonderful decision to incorporate Splendid Racing Teapots into their events, I caught up with Ben Henderson a musician and a ‘chief bottle washer’ at the Convivial. Ben confided that he has been into steampunk perhaps even before it became ‘a thing’, as evidenced by this photo of Ben in top hat. Ben was not sure how he heard about Splendid Teapot Racing, but he was very much impressed by the idea and the ‘sophistication’ of the course’s obstacles. Ben explained to me that at the Convivial which has been going now for 4 years, they race remote controlled vehicles, but racing the teapots “put a slightly different spin on it” which Ben liked. To sum up the crowd was suitably entertained and showed their appreciation with cheers,” they ooooh’d, they spluttered into their beers, they coo’ed!” at the rampaging teapots. Impressively, even in the negotiation of the death defying obstacles, not a single piece of china was damaged in the process – nearly unheard off. 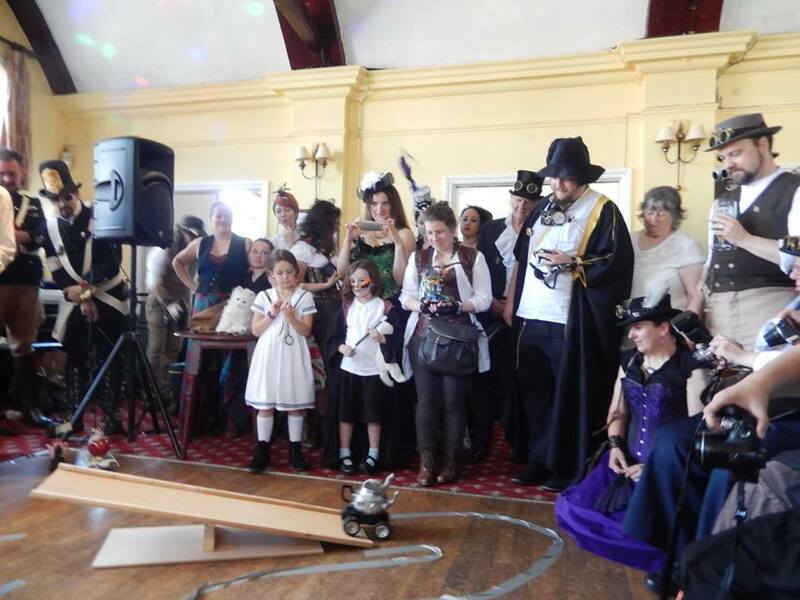 Well done Surrey Steampunk Convivial – I hope to be there next year if all goes well. For further information on their next event check out this link – The Nonsuch Christmas. It will have Christmas Pudding races…… But, rest assured there shall be more Splendid Teapot Racing at The Surrey Steampunk Convivial – Barnabas is in training, and – may the best teapot win! Thank you most kindly from your friends over here in Great Britain! 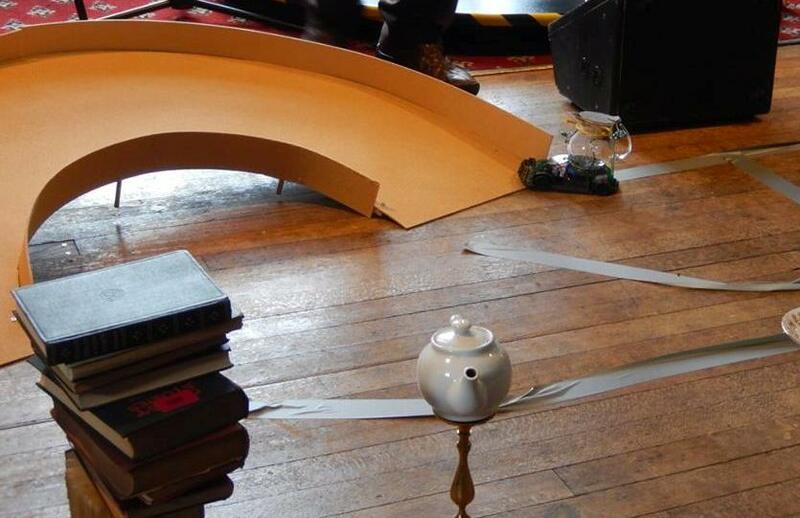 We have since been having some jolly Splendid Teapot Racing at The Costume Games in Brighton as well – the Seesaw of Indecision appears to need minor repairs as a small human attempted this part of the course. 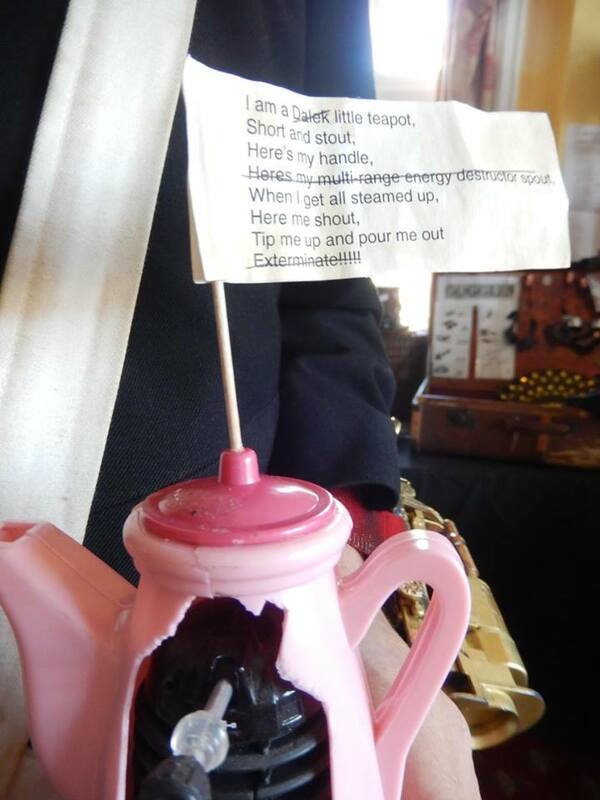 For all interested in Splendid Teapot Racing in Great Britain, there is a Facebook thingummy whatsit over here: https://www.facebook.com/groups/887820384605527/?fref=ts Do come and join us! Excellent news, I am very pleased the racing is going so well. Yes, I see your dilemma, small humans can be a little unpredictable at times, however they are very useful for edging the course with so a rig does not go out of bounds.